We’re always fascinated with all things wedding related and lately, we’ve been looking at some of the magical elements; those traditions passed onto modern brides and grooms from hundreds of years of cultured traditions and superstitions. The day of a wedding is always so enchanting, filled with love and we’ve all heard the old English bridal rhyme, ”Something old, something new, something borrowed, something blue, and a silver sixpence in her shoe.” But, what does it mean and what other traditions and superstitions around the wedding day do we all hold here in the United Kingdom – and what are popular customs abroad, do they differ from ours? To begin with, the rhyme is full of good luck charms a bride should wear on her wedding day to bring her good luck in her marriage. It’s been known since 1883 – how wonderful to know brides since 1883 have been partaking in the same superstitions as modern brides! The something old could be an item you carry with you that’s been passed down through the family; usually an item of jewellery so you can wear it in honour of someone to keep them with you as you marry. The meaning of something old is the desire the previous life the couple led before their marriage comes with them into their new lives now they’re wed. It’s also been reported to be to provide protection for the baby to come; but either way the sentiment is the same, for continuation bringing something old to the wedding to remember the old as they celebrate the new marriage. Something New is representative of the new marriage as the couple begin their new lives together in unity. Common symbols of this by brides include the wedding rings themselves – a new item of jewellery presented to each other by their beloved to seal the promise of marriage. It’s perhaps the most symbolic item of jewellery there and something new for your wedding that you will treasure forever. If you’re looking for your dream wedding band, view our full Collection now; from diamond pave bands or single set diamonds to bespoke laser designs and plain bands we’ve got lots to choose from. ”Something borrowed” sits in reference to something that another happy bride has worn. The meaning behind this is that she’s passing her good luck and fortune with her own partner onto the bride. The things that the modern brides borrow are endless; from jewellery to cake toppers to veils, there’s lots of wonderful and thoughtful examples of the something borrowed. The ”something blue” represents love, purity and fidelity. A sapphire cocktail ring or sapphire pendant will stand out against the ivory of your dress, an added touch of glitz and glamour. 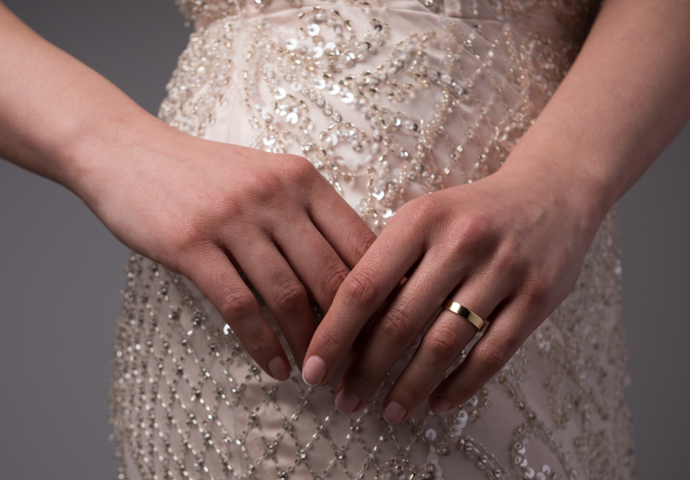 If it’s a ring you’re wearing, make sure it sits on your right hand – you don’t want to detract away from the wedding ring exchange which on photos can look overshadowed by larger jewellery items. During the ceremony, your engagement ring will sit on the right hand ring finger until being moved back after the ceremony to sit alongside your engagement ring – the engagement ring being the promise and the wedding ring sitting proudly as the symbol of the promise to spend the rest of your lives together. A Silver sixpence in her shoe is something traditionally the father of the bride gifts his daughter. It stands as a symbol of his wishes towards her and her new partner to wish them love, happiness and prosperity. You might even have an old sixpence that could double as your something old! If not, you can order one online which is a popular choice for today’s weddings who want to keep the traditions. In Filipino weddings, the bride and groom release two doves into the air – these represent their wish of a long and harmonious life together. In Japan, the bride and groom take part in the tradition of san-san-kudo. Both the bride and groom take three sips each of three flat sake cups – which their parents then do the same which is symbolic of bonding the families together. 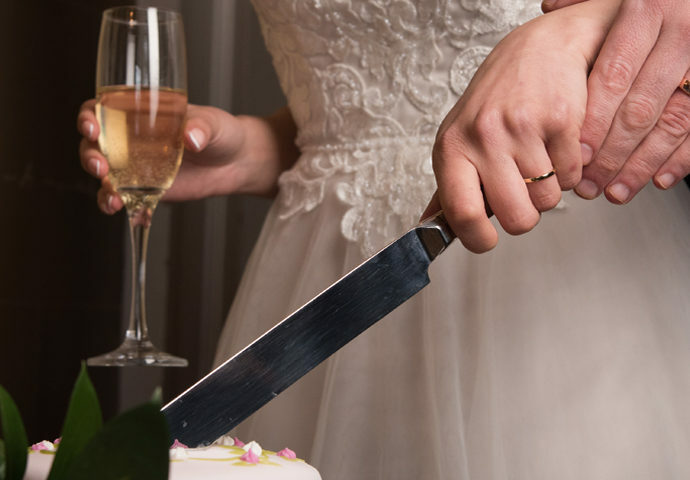 In Germany, the tradition is for newlyweds to saw a log in half in front of their guests – demonstrating their team work ability which will take them through their lives together as a partnership. In Scotland the tradition is to take part in a Blackening where the traditional wedding custom is performed in the days – or weeks – before the weddings where the bride and groom are given alcohol then covered with treacle, ash, feathers and flour by their friends and family. The subsequent mess was traditionally thought to avoid evil spirits and bring good luck. It’s thought, though not known, that the tradition’s roots lie in the solemn feet washing. In India, the tradition is for the bride’s sisters to play a trick on the groom by stealing his shoes upon his entrance to the wedding tent; he must subsequently bribe them to return his shoes before he exits. Another Indian custom that you will recognise is the beautiful Henna designs that decorate the hands and arms of the bride and female guests at her wedding; the intricate designs are representative of the love of the occasion as well as the joy and hope for the newlyweds future lives. In Australia, one custom is a unity bowl. The thought behind this is that guests are given pretty stones and during the ceremony, they have to hold them and then after the ceremony, they all pop them into a decorative bowl which the couple keep and display in their home. The sentiment is that they can remember forever the support and well wishes they had to begin their marriage as all their loved ones held the stones and wished the couple love and happiness. There you go! There’s lots of other wonderful traditions from all over the globe but this is just a few. We love reading about them, so if you know any more, make sure to send us them on social media. The fact that all around the World, we all celebrate love is a lovely thought; no matter if it’s a silver sixpence in a shoe or releasing doves, it’s the sentiment behind it and all the love that surrounds a wedding that we really makes it all so magical. 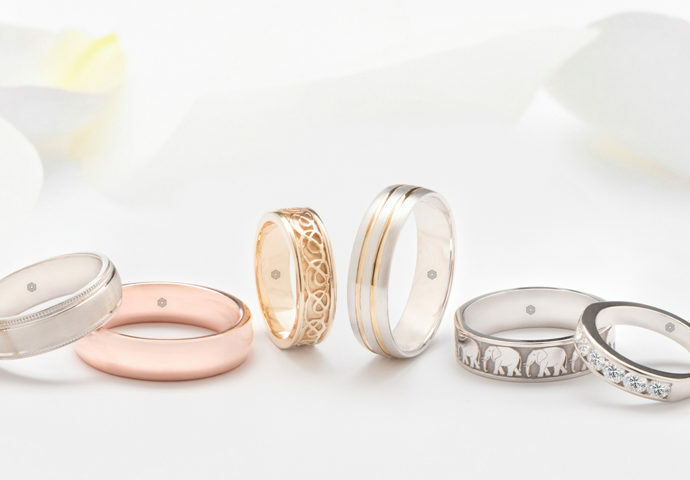 If you’re looking for your dream wedding bands, don’t forget to have a look through our entire Collection.